(The following excerpt is by Don Dunphy, from his book "Don Dunphy At Ringside" - copyright 1988 by Dunphy. Published by Henry Holt & Company). 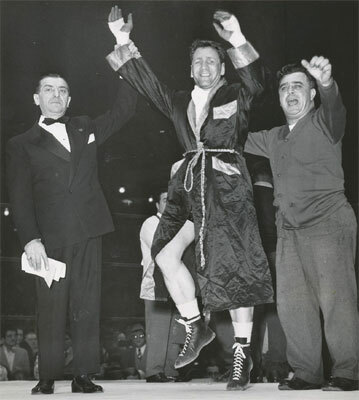 In 1947, "Black Jack" Billy Fox, a young phenomenon from Philadelphia, amassed a terrifically impressive record and challenged Gus for the title at Madison Square Garden. It was a tough fight, but Lesnevich's greater experience carried him to victory over the youngster, whom he finally kayoed in ten rounds. But it was a tough and grueling fight for the champion. They were rematched at the Garden on March 5, 1948. 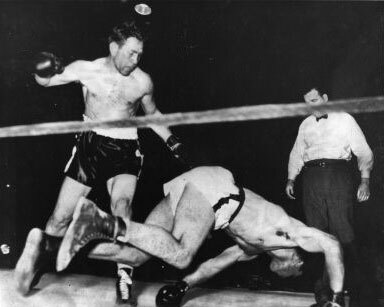 On November 14, 1947, Fox had stopped indestructible Jake LaMotta in what became known as "the tainted bout." Now it was felt that Fox had the experience necessary to beat Lesnevich for the crown. He had given a good account of himself against Lesnevich in the first bout, and many thought he could unseat the champion, who had by then been fighting for fifteen years. I don't know what Lesnevich's thoughts were on the subject, but that night he introduced the trap play into boxing. At the bell, the champion and the challenger advanced cautiously toward each other. Lesnevich was known as a very slow starter, so I'm sure Fox wasn't surprised when Lesnevich grabbed him in a quick clinch. The referee broke them, and Gus quickly grabbed Billy a second time. They separated and Gus clinched again. You could see by the look on Billy's face that he was surprised at the clinching tactics of the champion. After the third clinch, Lesnevich moved toward Fox as though he would clinch again. Not to be outdone, Fox dropped his guard and so he could get a better grip on Lesnevich. But, wham! - it was no clinch. Gus fired a right-hand shot to Fox's unprotected jaw. It landed with terrific force right on the button and Fox went down and out in round one. Lesnevich was the winner and still champion, because of a well-executed trap play.